South Carolina's Grand Strand, a section of coastline 60 miles long, is one of the most popular vacation destinations in the United States. Most visitors choose the highly developed resort town of Myrtle Beach as their base, with its sandy beaches, abundant live music and theatrical venues, golf courses, and shopping. But the Grand Strand also offers quieter alternatives, from the beachless town of Murrells Inlet, known for seafood and salt marshes, to the historic port of Georgetown, with its delightful walking tour of antebellum buildings. 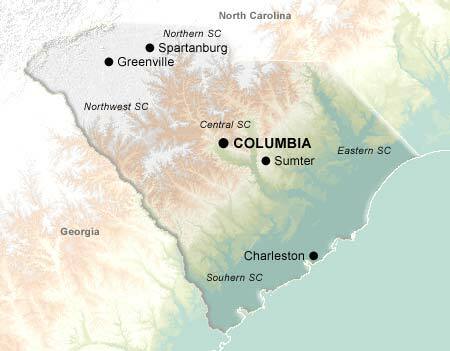 History buffs will find lots to appreciate throughout South Carolina. The state was the first to secede from the Union, starting the Civil War, and the war's first battle took place at Fort Sumter National Monument, now a National Monument. Kings Mountain National Military Park and Cowpens National Battlefield were both pivotal battlegrounds during the American Revolution. The Middleton Place, begun in 1941, are the oldest sculpted gardens in the United States. Table Rock State Park melds Native American history and natural beauty -- it is named for a lofty rock formation at which a giant chieftan dined, according to legend. South Carolina is also known for peaches, which it produces in greater quantity than any state except California; the peak season is June and July. Feeding the peach farms is a fair amount of annual precipitation, which also feeds a number of rivers. Some of the rivers are dammed, producing abundant amounts of hydro-electric power; some, like the Chattooga National Wild & Scenic River, are still wild and are favorites for whitewater rafting.